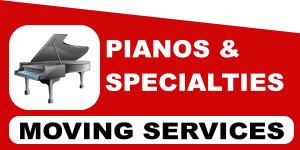 Discount South Florida Movers is your one stop shop for all your piano and specialty items moving needs. Our expert piano moving team will securely wrap and transport your piano, or any other large delicate items. We will transport it efficiently and securely. Our air ride trucks will transport your piano, or any large antique, safely to it’s new destination. With over 15 years experience our moving team will take the stress out of transporting such a fragile and expensive piece. Our team is highly trained to get the job done right the first time, and every time. Whether you are moving your piano down the street or across the state Discount South Florida Movers will provide you with a friendly, stress free move. Why Choose South Florida Professional Piano Movers? Pianos are valuable and a major investment. They are delicate and do not tolerate being mistreated very well. Not only is it unsafe but attempting to move a piano yourself could wind up a financial disaster. Using a professional piano moving company is the best solution to protect yourself and avoid costly mistakes. Discount South Florida Movers knows how to properly prepare and load a piano for transport. Your piano will reach it’s destination in a safe and efficient manner. Your valuables come in all different shapes and sizes – some of which are quite difficult to move from one place to another. For that reason, Discount South Florida Movers are proud to offer specialty moving services to care for even your most difficult to move items. Discount South Florida Movers are fully licensed, insured and bonded in the state of Florida. Our South Florida relocation team will always strive to exceed your expectations and provide you with quality service and piece of mind. All this at the lowest price in town. Discount South Florida piano and large specialty items movers provide expert and cost-effective moving services. No job is too big or delicate.